Military Marksmanship Training Versus Competitive Shooting Training: The Matchup | DefenseReview.com (DR): An online tactical technology and military defense technology magazine with particular focus on the latest and greatest tactical firearms news (tactical gun news), tactical gear news and tactical shooting news. All photos contained in this article are copyrighted. Jeff Gurwitch and DefenseReview.com (DR) own the copyright on these photos. I started competitive shooting around Jan 2000 in USPSA matches. 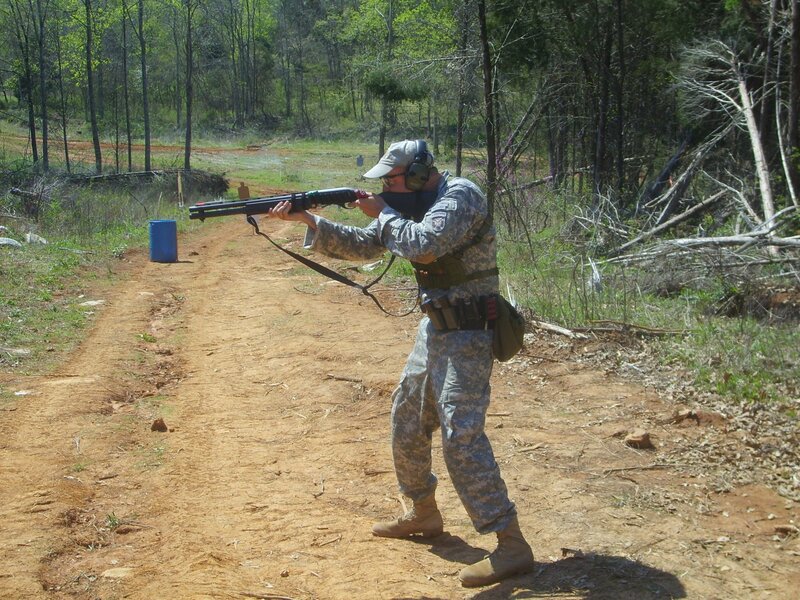 At that time, my shooting experience consisted solely of my military training (10 years in the Army at that point). When I hit my very first match, I soon found out (by the end of the first stage!) that I could in no way match the speed of the other shooters. Not just in split times per shot, but in the way the other competitors moved through the courses of fire. There is one thing that did go pretty well for me that very first match; my gun basic handling skills. Example: running with a “hot” gun and being safe, and the tasks involved with keeping my pistol running. Reloading, clearing malfuntions/jams, etc. went really well. And although I could not match other shooters’ split times, accuracy wise, I was in the top 10%. So now, 10 years later and many matches behind me, I have observed many times over just about the same results from other first-time shooters with military backgrounds at matches. Soldiers do very well in terms of accuracy, but split times between shots, while well above the average first time civilian shooter, are not up there with the top 10-20% of the match overall. This leads me to the main subject I would like to address in this article: the evolution and comparison of military training with competition training. I want to try and answer the questions of what training methods are borrowed from each other and what do both military training and shooting competition have in common, and the benefits of both. My time in Special Forces started in 1998. Where I was assigned, I did not see a pro timer being used for training until about 2 years later ( this is not to say SF didn’t use them at all, just that the team I was on didn’t use one). This leads me to a major difference–and this is a key factor–especially in pistol training, at least in the late 1990’s: in Special Operations, in general, basic pistol training’s primary focus was on accuracy, with little regard for the time it took to produce good hits. The best example of this: the average introduction to pistol shooting sessions started with shooting 3-6 inch dots at distances of 3-10 meters. Soldiers were judged not on how fast they executed their shots, but on the final results on paper, whether or not all hits were in the small circles at the given range. 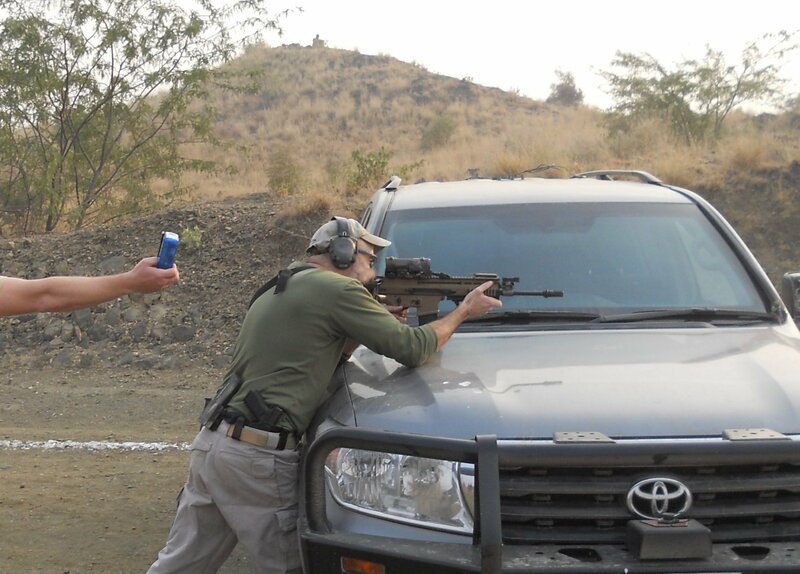 This method of training, at least with pistol, usually resulted in a shooter who can sit there all day long and key-hole double taps and 5-shot strings. However, from the holster, for time, you would see guys bust out first round hits around the 2.5-second mark, which is way too slow compared to the competition average of 1 to 1.5 second from the holster. By contrast, with competitive training, the goal based around getting shots in a “A” zone or similar sized center zone as fast as you can. From the very beginning, accuracy AND speed are worked on in tandem. As every knows, in competition, yes, center hits are required, but you have to do it as fast as you can if you want a chance of placing well. This leads me to one very large fundamental difference between military training and competitive training: the overall intent or end state. In the military, especially in Special Operations, the method of engagements are based on team tactics. Training on the range is conducted in support of covering angles and engaging targets in a certain order to facilitate shooting as a member of an assault team. That does not always equate to a good fast time when shooting as a lone shooter on a course of fire in a match. A good example of this would be having to shoot in ‘Tactical Priority’ (all targets get one shot before giving them another) in IDPA. This is totally contrary to military training. As a military shooter you would at least double-tap a target (shoot the target at least twice, rapidly) before moving on to the next one, knowing that your teammates are at the same time engaging the other targets. This works out to a “wall of lead” being thrown out to however many targets are present at the same time. So it is with this method of engaging targets that shooters are trained, with maximum emphasis on accuracy, then speed. Reason: your job is to drive down the target in your primary engagement zone. This is in direct opposition to competitive shooting training, where, to do well, one has to incorporate speed in the very beginning in order to prepare for handling courses of fire with multiple targets. The goal: shooting not just accurately, but also FAST, to achieve a good time (lowest time possible). The military shooter’s engagement speed is based on knowing his buddies are shooting at the target or targets he is not, so his primary goal is to shoot the target with accurate hits until it is no longer a threat. I believe military training does get the edge over civilian competitive training in 2 areas: The first is moving and shooting. It is a necessity to be able to engage targets while on the move in CQB situations, and this is one skill at which Special Operations soldiers excel. Again, because training has to support team movements, shooting on the move is a key task trained-on with both pistol and rifle. Hands down, in a soldier’s first match against the average civilian competitor, you can bet soldiers are not afraid to take shots moving and are pretty good at it. I must add, though, that shooting on the move is not always the fastest way to shoot a stage in a match. As many seasoned competitors know one of the best methods to take on a stage, especially field courses, is to move from point to point (as few possible) in a way that offers you the best view of the most targets at any one time, and then engage them that way, as opposed to trying to move at a set controlled pace and shoot on the move. This is the “game” part of competitive shooting that everyone, military and civilian, usually learn over time through experience. 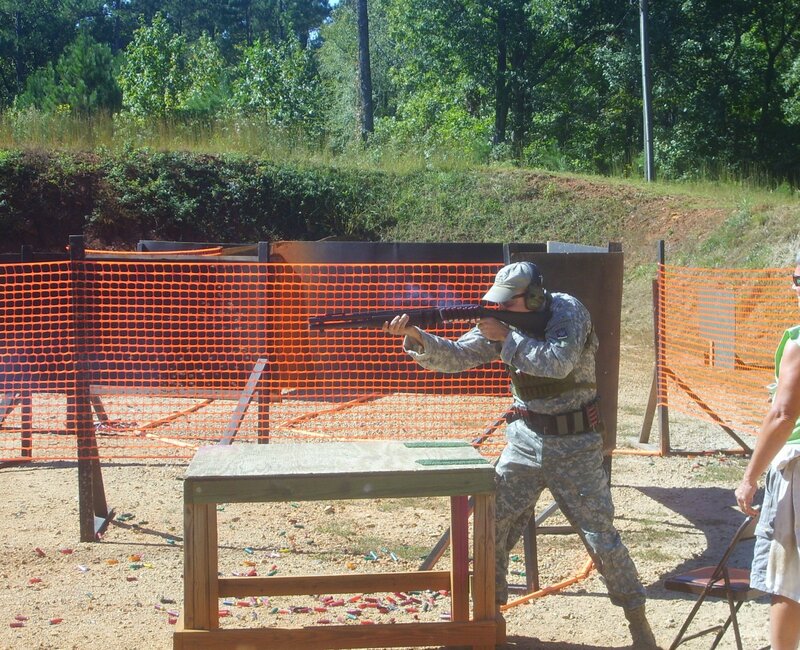 The second area soldiers generally excel at is rifle shooting. Running an AR (AR-15 rifle/carbine/SBR) hard and fast is what Special Operations soldiers do. There are a few reasons: 1) the military has tons of ranges where soldiers can shoot anywhere from 25 meters out to 600 meters and beyond for practice. 2) ammunition for training is not usually an issue. Shooting 5000-7000 rounds of rifle ammo (per soldier) during pre-mission training over a period of a few weeks is not uncommon. At the entry level, most soldiers can shoot just as fast with a stock AR compared to a civilian with an “Open class” race ready AR. Again what hurts soldiers in competition, regardless of their individual marksmanship skill, is knowing the game and how to run through the course of fire in the fastest way possible. Now, I know there are some shooters out there, both military and civilian, who believe competing in any shooting sport, USPSA 3-Gun, even IDPA, is not only unnecessary, but can even hurt your shooting skills. I believe this view is totally wrong. As long as you keep your training in the proper context and know that shooting in matches is not the same as the “real thing”, the benefits of competition cannot be overlooked. While a run-and-gun stage in USPSA teaches nothing in the way of tactics and how to stay alive in a gun fight, it does support two things that are required in any shooting situation: shooting fast and shooting accurately. Where better to learn how to shoot 4 to 5 shots per second strings accurately at targets than in competition? In addition to having to shoot at maximum speed with good hits, basic gun handling skills are reinforced during most courses of fire, including weapon presentations, reloading, clearing malfunctions/jams if they happen, and, most importantly, moving safely with a firearm that is ready to fire. I will add that I, myself, have never heard of someone in combat being required to do a 1-second reload with a pistol (something you need to be able to do in a match if you want to win). That said, acquiring that skill from competition definitely can’t hurt. This brings me back to my very first match; although I had solid weapon handling fundamentals from my military training (reloading, running with the gun in a safe manner, drawing from the holster), being pressed to do these things quickly in matches has only improved my individual weapon handling skills. Thankfully, today, shooting in competition is widely recognized and accepted in Special Operations as an enhancement to training and a good way of enforcing good marksmanship and weapon handling skills. Shooting in Competition has grown so much so that I was lucky enough to compete as a member of a 3-Gun team representing the 1st Special Warfare Training Group (Airborne) out of Fort Bragg along with a few other SF members for a period of about 2 years. We traveled around the East Coast hitting a lot of the major 3-Gun events, like the Ft. Benning 3-Gun Challenge, for example. In the last 10 years, I think there has been explosive growth in both military members seeking out training from top competitors and civilians seeking training from former soldiers in tactical courses. This cross over is benefitting both soldiers and civilian shooters. Who better to teach soldiers how to get faster split times than a Pro USPSA or 3-Gun Champion? One person I must mention who I think pioneered some of the modern methods of training, at least with tactical rifle training, is Kyle Lamb, founder of Viking Tactics. I think Kyle was one of the first to successfully create a training program that uses the same techniques from competitive shooting and cross it over to tactical rifle shooting. He not only teaches how to shoot insanely fast split times with a rifle, but also keeps it in a tactical context. 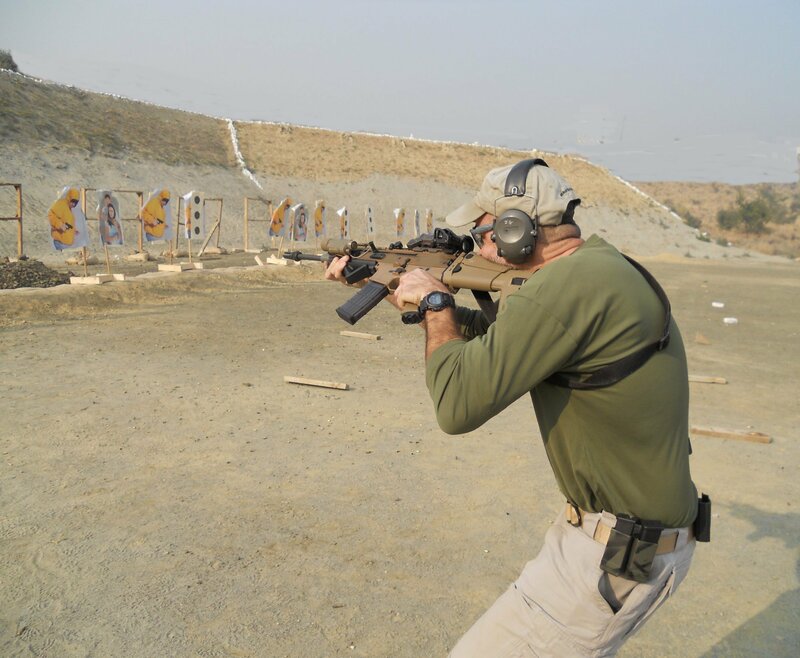 A lot of the drills he teaches in his courses have become standard in military marksmanship training programs today. Today, what civilians would call a field course “run and gun” stage in competition are commonly referred to as “stress courses” in the military, and have become the norm in training, the only real difference being that proper use of cover and/or tactical engagement sequences might be enforced in the stress shoots. Other than that, the average civilian competitor might not notice any other real difference between a stress shoot and a normal 3-Gun or USPSA stage. If you look at military methods of training and competition shooting today, I think they borrow a lot from each other. I was actually taught the current 3-Gun method of running with the rifle at the high ready and the push/pull method of mounting the rifle (the standard used by numerous top 3-Gun shooters today) about 10 years ago in a military course at the Direct Action Resource Center (DARC) in little Rock AR, a facility devoted to CQB (Close Quarters Battle) training for Special Operations personnel. I have already mentioned the military’s use of stress courses to test shooter skills. In civilian matches, you will find there are numerous course of fire that mimic military situations; I myself have seen everything from starting a stage by shotgun-breeching doors to clearing trench lines, house stages that resemble military CQB scenarios, and even targets laden with fake explosives to look like suicide bombers. So, not only do military and competition still borrow the best methods of shooting from each other, but, now, real-world situations soldiers face are being introduced to the civilian shooter. Just like in most other sports, technology plays a large part in competitive shooting and in the military. For example, the M4/M4A1 Carbine’s flat top upper that was developed for the military in the 1990’s paved the way for more “purpose built” rifles like we see now in 3-Gun. Future requirements for the military will fuel new equipment, and future tactical situations will require new shooting methods and techniques to be developed. This will cross over into competition, and we will see the winning methods used in competition be passed back into the military. There is and always will be evolution and growth in military and competition training methods. It’s just that, at any one time, one (military or competition) will lead over the other in terms of the latest’s and greatest techniques and methods. © Copyright 2011 DefenseReview.com and Jeff Gurwitch. All rights reserved. This content/material may not be republished, broadcast, rewritten or redistributed without first receiving permission and providing proper credit and appropriate links. Why Competitive Shooters and Mixed Martial Arts (MMA) Practitioners have a Combat Advantage, and Why You should “Game it”! Next: SPA Defense/XADS TR3 Laser Rifle for Ship Defense/Anti-Piracy Operations: Hit ’em with the Big Green Laser Beam!